If Chairlift strike you as being concerned about the future, consider this: They're stuck with it one way or another. And they're young, so they presumably have a lot of it to see. The Brooklyn trio of Caroline Polachek, Aaron Pfenning and Patrick Wimberly, all twentysomethings, explore space and texture on their incisive and inventive debut album. A sense of unease pervades Does You Inspire You, whether it be from mounting trash ("Garbage"), shared living quarters ("Territory"), or the unknown and, possibly, insects ("Earwig Town"). Often there's a feeling of displacement, too, caused by uncommon combinations of sound. In "Planet Health," for instance, birdsong, gong and koto join sparkling keyboard and an R&B bass so funky it could have been raided from Bootsy Collins' living room. Lead singer Polachek arrives with her voice soaked in reverb, a quality that enhances the duality of the piece: She could be looking back on what she learned in health class, but she tells it from a perspective that could pass for an alien visitor's. Health is Planet Health. The food pyramid is a place to sightsee. Want to learn how to make a baby? They'll show you how. The chorus of "we're feeling great tonight" isn't as convincing as it reads, Polachek's overlapping vocals communicating a listlessness that becomes more apparent in tandem with Pfenning's part, the flatly spoken "we're feeling great." This contributes to the alienlike overtones. 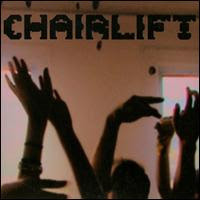 Two overt pop songs make Chairlift more difficult to pin down. "Evident Utensil" plinks and plonks with all kinds of synth gewgaws, and Polachek introduces us to a rickety falsetto. The focus here is on rhyme, resulting in lyrics that might at first strike listeners as juvenile or ill-considered. But the kookiness of the song, along with Pfenning's comically affected deep-voiced enunciation, gives reason to believe that it's played for laughs and might be a lampoon of pop itself. Earlier in the album, "Bruises" grabs hold with a bass line reminiscent of The Cure's "Close to Me" and paints an ostensibly sweet tale of young love, Polachek playing the part of the girl who banged up her body while attempting handstands, Pfenning's boy responding by fetching frozen strawberries to "ice your bruisy knees." Once again, however, the band have written the song cleverly enough to allow for more than face-value interpretation. In a MySpace blog post, they suggest, with morbid humor, that the cutesy-wootsy tune is actually a tragic case involving a strawberry allergy and anaphylactic shock. Polachek shows off her lilt in "Bruises" and yodel in "Earwig Town," both of which align her with the vocal techniques of Dolores O'Riordan of The Cranberries, perhaps an unconscious influence. Throughout the album, Polachek's vocal flexibility and subtle expressiveness make the songs more interesting. "Garbage," the lead-off track, scorns society's wastefulness. "So much garbage will never ever decay," Polachek sings. Here, her tone is straightforward and slightly weary, perhaps because it's her generation that is inheriting the toxic mess. But a quiet contempt can also be heard, and she adds, "dark and silent it waits for you." What does that mean? Well, you're headed for the grave. It's headed for the landfill. You're both going down to decompose. But your obituary in that buried newspaper will still be legible long after you're nothing but bones.